This entry was posted in Uncategorized on November 30, 2011 by sth2114. The chronicle Oil is the Color of my Skin, started with out of pure curiosity. I wanted to know how much the American consumer knows about oil. Oil is the most valuable resource in the world. Almost everything we use or do can be traced back to it. As a consumer myself, I have long to wonder where oil comes from. My venture outside to a local gas station became one of my last efforts to get answers from ordinary citizens like myself, in what seemed to be the most appropriate place; a gas station. My journey to finding answers began in a BP gas station on 128th street. I spent the afternoon asking pedestrians the same question over and over again. Do you where oil comes from? I became frustrated when most of them replied “I don’t know” or another common answer was the “Middle East.” My blog Oil is the Color of my Skin intended to address common misconceptions that oil only comes from the Middle East. I understand how the idea of oil coming from places other the Middle East can be quite hard to grasp, as the American media projects the idea that oil only comes this particular region. This blog breaks the barriers between what American consumers may have heard on the news and the other side of the story. Oil is the Color of my Skin, reveals that oil comes from more than just the Middle East, but from places all around the world. Tracing oil back to its origins landed us in two different continents and in seven different countries. We discovered that oil comes from the black markets of Guatemala and Belize, the war zones of Colombia and the Niger Delta, the Amazon in Ecuador, and poverty stricken areas in Angola. The idea behind following the oil trail and telling the stories of people who have been affected by oil development was to bring consciousness to the American consumer. The problem is that the American culture is one that encourages consumerism. This has blinded Americans about how the way we live our lives affects others around us. We often see the clothes and not the labor that went into making the shirt or Nike sneakers. We see only the oil and not the thousands of indigenous peoples that are displaced each year because oil was found in their communities. This question about oil became such a profound part of my life. This summer I had the opportunity to witness what oil development is doing to the indigenous Secoya community in the Amazon jungle. My internship with Esperanza International was over two months period and during that time I never saw so much devastation. Oil companies left oil pits that made the land infertile to grow crops and rows of empty houses of people dying off from cancer. The oil companies replaced trees with oil pipes and were not held accountable for the leaks that ran through the nearby river. The same rivers where people washed their clothes, took baths, and went fishing. For me this was more than just an unfortunate situation for the Secoya, but it highlights one of our greatest faults. American uses more oil than any other place in the world, even China that is twice its size. Yet we do not realize how the way we live our lives affects those around us. The first problem is the way that we perceive people that are in oil rich areas. We consider these people as burdens that are standing in our way of getting what we really want. It is this kind of idea that led to inequalities and has caused oil to be more valuable than people’s lives. Prime examples of this are the Afro-Colombian and Nigerian in the Niger Delta, which proves that the notions of human rights exclude these groups of people. Oil is the color of my skin points out that no one’s life should be valued over any other. The second problem is that Americans have come to just accept things, as the way they are. Part of the reason behind this that we feel we have no ability to change them, but we do. Oil is the Color of my skin encourages a more conscious lifestyle, by letting people know about information that the media never reports on. Oil towns and the devastation that it causes will probably never be shown the news, but it is up to you to do your own research. I encourage you take steps to find out information that the media might not be telling us because you should know the truth. The most important thing that I want you take away from this blog is that change is possible and little changes do make a difference. I am not asking you to get rid of anything that requires oil, but to determine what a change might mean for you. I could be riding a bike to a grocery store that is three blocks away instead of taking a car or turning of your lights every time you leave. Because small changes do matter and communities a thousand of miles away depend on it. This entry was posted in Uncategorized on November 23, 2011 by sth2114. Pirates in the Niger Delta have been called everything from a “menace” to “terrorist. Nevertheless, the media only presents one side to the story. So far this year, the area surrounding the Niger Delta has had a record amount of twenty pirate attacks and eight cases of hijacked ships. The increase of piracy has been attributed to the rise of militant groups in the area known as the Movement for the Emancipation of the Niger Delta (MEND). Since its establishment in 2006, MEND has been responsible for attacks on oil pipelines and kidnappings. 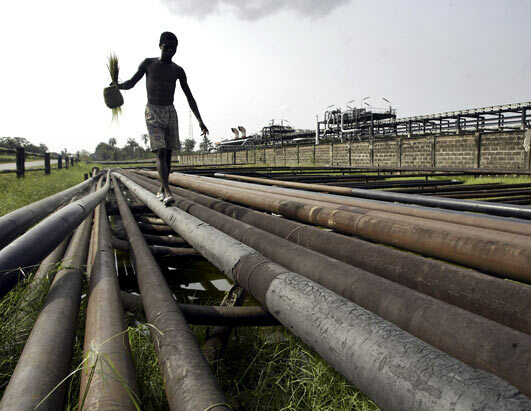 These criminal activities have reduced oil output in the Niger Delta by roughly one-third. The disruption of the oil industry is part of MEND’s overall objective, which is to gain complete control of the oil wealth that people of the oil Delta claim they have been robbed of. Since the oil boom in the 1970’s, Nigeria’s economy has come to be highly dependent on oil. The United States is the nation’s biggest oil importer, as it supplies over 8% of U.S. oil imports, nearly half of Nigeria’s daily oil production. In 2008, Nigeria made more than thirty-eight billion dollars from trading with the United States alone. According to the Economic Intelligence Unit (EIU), the future looks bright for Nigeria’s economy. It is expected to grow at an average range of 3.5% in the next five years. Yet for the people in the Niger Delta where twenty percent of Nigeria’s oil deposits are located, there are no signs of progress. Instead there are signs of retrogression. Oil companies in the area have not brought jobs or money to the communities in the Niger Delta. In fact about 66% of the population now falls below the poverty line of about a dollar a day, compared to 43% in 1985. There is an increased amount of environmental degradation, due to the Nigerian’s government’s failure to regulate foreign oil industries. As many as 546 million gallons of oil have spilled into the Niger Delta over the last five decades. The increase in oil production has resulted in riverbank erosion, frequent gas flares, and deforestation. as production gets under way, Farms and sacred lands are either acquired for oil and gas development or polluted. The MEND militant group is composed of victims of the oil companies, which leave with profits and stripped the Delta of everything. Piracy in the Niger Delta continues and MEND remarks that it will not halt until all foreign companies leave the Delta and no longer deal with the Nigerian government. This entry was posted in Uncategorized on November 23, 2011 by Dolma Tsechu. This week’s post will cover the effects of global climate change on the glaciers of Tibet and how this will effect the populations living downstream. Tibet is also called the ‘Third pole’ as it contains more than 46,000 glaciers, the source of the major rivers in Asia. In recent years, Tibet has seen a continuous rise in temperatures at the rate of 0.3 degree Celsius per decade, which is twice the global average temperature rise. The Tibetan Plateau is often called the barometer of Asia because its vast highlands warm faster than the oceans, which then raises the temperatures and creates an area of low pressure. This pressure gradient draws in heavy amount of moist air from the Indian Ocean and spreading it out through different regions, making it the driver of Asian monsoon. (Source: David Breashears) Comparing the glaciers from 1921 to today’s. 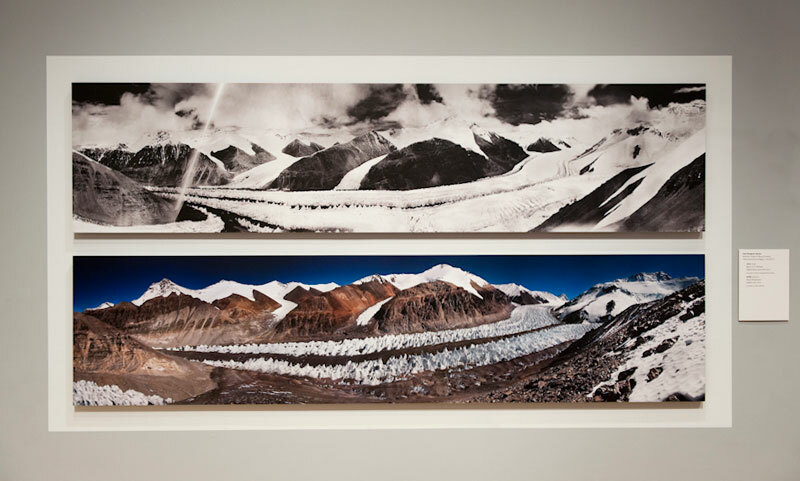 A simple visual comparison of the pictures that filmmaker and mountaineer David Breasher took of Rongbuk in 2008 with the pictures that George Mallory took of Rongbuk during his expeditions in 1921 brings to light the significant loss of ice mass in this area. The magnitude of glacier melting can be seen at the Rongbuk glacier on the northern slope of Mount Everest. Global climate change has sped up the rate of glacial melt. 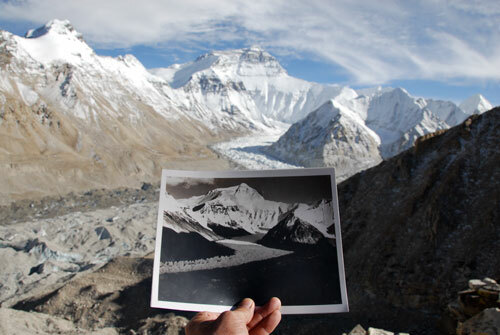 (Source: David Bearshers) Comparing the image of the same glacier in 1921 to today. According to the Chinese Academy of Science, glaciers on the Tibetan Plateau are melting at a rate of 7% annually and if the current rate continues, two-thirds of the glaciers on the plateau will be gone by 2050. The International Center for Integrated Mountain Development (ICIMOD), an organization that conducts research on the environment in the Hindu-Kush part of the Himalayas has revealed alarming details on the ecology. According to ICIMOD’s findings, the current trend of melting suggests that the Ganges, Indus, Brahmaputra and other rivers across the Northern India plains would most likely become seasonal rivers in the near future instead of remaining perennial. My previous post on the effects of freshwater deprivation to local communities further explored the impacts. The formation of glacial lakes as a result of the rapid melting of glaciers on the higher reaches of the mountain ranges continues to pose a serious threat to livelihood downstream. ICIMOD has identified some 8,790 glacial lakes in parts of the Hindu-Kush Himalayas out of which, it has confirmed 204 glacial lakes as ‘likely to burst’. The sudden discharge of a large volume of water with debris would lead to massive floods known as the glacial lake outburst floods. Around 15 Glacial Lake Outburst Floods have been recorded in the Tibet Autonomous Region alone between 1930 and 2002. They have claimed many lives and properties. The most infamous floods in Pakistan last year that left 13.8 million people dead and 1,600 dead is directly related to the strong supercharged monsoon jetstreams that form over Tibet. Jean-Pascal van Ypersele, vice president of the Intergovernmental Panel on Climate Change (IPCC), claimed that these floods are results of the rapid global climate change, which has made the most drastic signs of changes on the glaciers of Tibet. (Source: The Telegraph) The massive destruction unleashed by flash floods in Pakistan. When glacier melts, it destabilizes the entire surrounding land, posing the threat of large landslides. These landslides sometimes block the river-ways forming unstable lakes. Such lakes always carry the danger of breaking its temporary barriers and causing flash floods downstream. For example, on April 9, 2000, a large landslide Eastern Tibet formed a landslide dam on a tributary of the Brahmaputra River. On June 10, 2000, the dam breached resulting in flash floods which caused the death of 30 peoples and the disappearance of more than 100 peoples. This flash flood in five downstream districts of Eastern India left 50,000 peoples homeless. The total economic loss was estimated at more than 22.9 million USD. Permafrost covers a large percentage of the Tibetan Plateau. About one-third of the world’s soil carbon is stored in these permafrost regions. With its degradation, due to drastic rise in temperatures, a huge amount of carbon continues to be released into the atmosphere, contributing to global climate change. A large part of the headwaters of the Yellow River, which supports a large portion of the Chinese population is underlain by permafrost. The melting of the permafrost along with other factors have led to the quick dry-up of the river which often has failed to reach the sea. In 1998 the Yellow River failed to reach the sea for 260 days. Experts have estimated that cities near Beijing and Tianjin could run out of water in the coming five to seven years. In order to fix the huge water shortage problems in its northern plains, China is currently undertaking large-scale diversion initiative to drain water from the Yangtze in the South-to-North Water Diversion Project. According to Qinghai Province’s Surveying and Mapping Bureau, 5.3% of the glaciers in the headwaters of the Yangtze River has disappeared inside the last three decades. The severe Yangtze drought in 2011 that lasted for 6 months, which was considered to be the worst in 50 years. 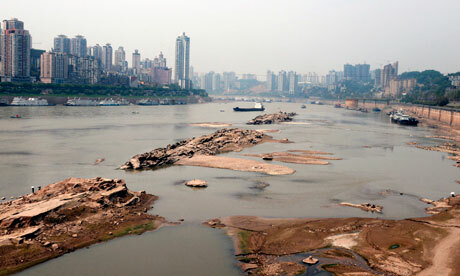 (Source: the Guardian) Dried up Yangtze River in Chongqing City. This entry was posted in Uncategorized on November 23, 2011 by Lydia Schulman. Ship groundings, instances when boats crash into and get stuck on coral reefs, are dangerous both to the ships’ passengers and to coral reefs. A ship grounded on a coral reef. Photo Courtesy of JustinIs/Flickr. Groundings sometimes occur as a result forces beyond human control, such as stronger-than-predicted tides, but they also occur as a result of carelessness and human error. Given the abundance of sea-faring navigation technology and maritime traffic regulation that exists today, groundings are one threat to coral reefs that can be prevented. On a basic level, ship groundings harm coral reefs because they physically break or crush them. However, groundings can also have less obvious, residual impacts on the health of coral reefs. To further the tragedy, the ship, which left a 3,000 m by 260 meter “scar” in the reef, was carrying 65,000 tons of coal and 950 tons of fuel oil. According to Kamenev’s article, the equivalent of 2,000 to 5,000 liters of heavy fuel oil seeped into the water with the collision. For video coverage, and more information on this grounding, see the video below. Damage sustained by coral reefs as a result of ship groundings is not limited to physical crushing of the reef structure. Added risks come from materials that leak into the sea upon grounding. One of these materials is a type of paint often used on the hulls of ships. When shipping vessels crash into reefs, heavy metals and other toxins are often left behind. This can lead to further damage to the coral that actually survives the initial impact of the grounding. In their article, “Understanding ship-grounding impacts on a coral reef: potential effects of anti-foulant paint contamination on coral recruitment” Negri, et. al, write, based on a case study of a grounding on a reef off of Malaysia, that “The recovery of reefs from ship-groundings is often very slow and in many cases may take decades (Precht, 1998).” They argue that “apart from acute and chronic toxicity towards sessile adult invertebrates such as corals, anti-foulant contamination has the potential to impact on the recruitment of invertebrates to the damaged site, therefore slowing subsequent ecosystem recovery.” Thus, the impacts of ship groundings on coral reefs seem to be greater than the immeditate damage sustained given that contaiments from anti-foulant paints can slow the recovery of the reef. Small vessel groundings can also cause physical damage to reefs. It doesn’t take an oil tanker to physically damage a coral reef. Coral reefs are so delicate that even small boats can crush and seriously damage coral colonies. Recreational and professional boaters alike should take care to stay in marked channels, pay attention to maritime regulations, and treat the process of captaining a boat as seriously as one would treat driving any other type of vehicle. This entry was posted in Uncategorized on November 23, 2011 by Gabriella Spitzer. Storm King Art Center is a unique 500 acre sculpture park in the Hudson Highlands, an hour north of New York City, where the landscape and the art have equal importance as the exhibits are curated and created. The grass, trees, and sky are part of the gallery—the natural environment not only compliments the art, the natural environment is part of the art. In 1960, father and son team Ralph E. Ogden and Peter Stern established Storm King Art Center as a museum dedicated to the Hudson River School paintings. They began to collect sculptures to place around the outside of the building. When the art center purchased thirteen works by David Smith in 1966, they had an aha moment, realizing that placing the art in the landscape enhances the art and the landscape, and ever since then, art has been placed with its immediate surroundings as well as its far off landscape in mind. 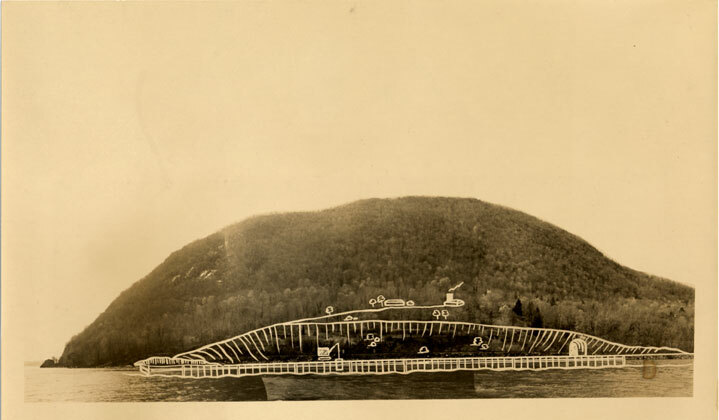 Around that time, however, Storm King Mountain was in danger of becoming the site of a hydroelectric power plant by Consolidated Edison Company. The local community mobilized, creating the Scenic Hudson Preservation Committee and challenging the plan in court. They ultimately won, though it took almost twenty years for all of the battles to be fought. Their efforts inspired the modern environmentalist movement as a multidisciplinary movement of scientists, concerned citizens, journalists, lawyers, and even artists. One of the groups that grew out of the Storm King Mountain Controversy is the Open Space Institute (OSI), an organization which buys land for the sake of protecting it or makes sure that people will not develop land. Storm King Art Center works closely with OSI to protect the lands around the outdoor galleries so that the art’s landscapes will be preserved. Storm King Art Center is located physically and historically in the middle of this landscape. The Hudson River Valley’s beauty inspired the Hudson River School artists to develop new ways of portraying light in paintings, and the fight to preserve its natural resources began the modern environmentalist movement. property. Part of Storm King Art Center’s mission is to curate “monumental art set against the landscape with beautiful vistas,” as the President of the art center says in a video on their website. They do this by curating every piece carefully in the space and landscape chosen for it. This sometimes involves changing the landscape—moving earth to make slopes, enhancing the soil security through flattening very steep gradients, or (my favorite) planting trees in three sides of a square to create a “maple gallery.” They are, however, always careful to balance the ecological needs with the art’s needs. Because the landscape and natural environment is as important to their mission as the art, they cultivate a sense of environmental stewardship. For example, as Davidowitz explained to me, they used to grow and bale hay in several acres of the grounds of art center every year as a way of commemorating that the land used to be farm land. They stopped doing this, however, just in the last few years in favor of planting native grasses and wildflowers because they learned of recent research that has shown the negative effects of exotic species on soil composition and overall ecology of landscapes. “Planting local flora and fauna is important to us from the standpoint of environmental stewardship,” Davidowitz shared, “but it also affects the visitor’s experiences of the art.” The art and the environment are truly one and the same. A visitor’s experience at Storm King Art Center involves multiple senses. The sculptures can be seen and touched; some (especially the metal pieces) can also be heard by hitting them with rubber mallets. The weather is felt by the viewer as well, and it is also felt by the art installation and by the landscape. This reflects the multisensory, interdisciplinary, and unifying nature of nature itself: it cannot simply be seen, heard, felt or thought about—it must be experienced in all of those ways and it connects us all. Therefore the phrase “environmentalist art” should not provoke confusion but should rather feel redundant. The depth of the connection that we feel to the environment, the confusion and moment of transition of climate change, activism and protest can and should be expressed through art and experienced in as many ways as we can imagine. This entry was posted in Uncategorized on November 18, 2011 by Dolma Tsechu. While my previous posts have been covering the environmental degradation and modernization in Tibet, this post will cover the waste management problems that is a direct result of modernization and project I plan on implementing in Tibet to address this issue. Currently there are no waste management infrastructure in Tibet; it is a very pressing issue that has immediate affects on the environment and communities environment of the Tibetan grasslands. While rapid modernization is taking place in Tibet, flocks of tourists and consumeristic goods are coming in, too. Plastic snack cover wrappers and soda cans discarded by tourists and locals are now a very visible part of the Tibetan grasslands as my friend Yishin Khoo, who traveled to Tibet this past summer, mentioned. Waste Management is a serious problem affecting the public and environmental health of Tibetan rural areas in China. It is a very pressing issue as Tibetan areas are facing rapid modernization and the locals are not exposed to the consequences of mismanagement of proper waste disposal. These areas do not have any facility for waste management; the current option is either burn or bury, which seriously degrades the land. It also raises a serious environmental concern. This causes many problems but the most serious with the heaviest repercussion one is contamination of drinking water sources because, as I mentioned in my last post, Tibet is the headwater of billions living downstream all over Asia. (Source: Yishin Khoo) Waste clogging the water near the Yangtze River. Since Tibet is a very large land mass and the population is spread out, the government states that it is difficult for them to set up waste collection system to these remote areas. This fact strongly urged me to lead a service trip to Tibet to build resources such as waste receptacles and teach the community on proper management and composting. This is a very urgent need in the local Tibetan communities and they do not have much resources to create and raise awareness about the issue. In order to lead this trip, I will be partnering with Conscious Journeys, a travel agency which operates under the Tibetan Village Project, a non-profit, non-political organization dedicated to promoting sustainable development while preserving the rich cultural heritage of Tibet through Tibetan agency in a bottom-up approach. Most of their projects are small-scale initiatives that work directly with Tibetan villagers through project-coordinators chosen from each village who know the local situation, understand the culture, and speak the language. They have been running trips for western tourist groups for the past ten years. Conscious Journey is the brainchild of Weatherhead East Asian Institute at Columbia; Weatherhead also continues to serve as an advisor and financial sponsor for it. Working with Tibetan Village Project will help us accomplish our team goals because TVP is very well connected in the Tibetan areas since they are part of the local community and have been working together for the past decade. TVP’s goal in giving agency to the Tibetans is very similar to our vision and once the participants from the service trip set up the foundations for waste management, TVP will ensure the longevity of the project. Team members will be expected to commit to weekly meetings and participate with the core commitment of Plateau Engage at Columbia University to the ideals of service and engagement. Plateau Engage works to develop new opportunities for education and training, as well as supporting initiatives that advance the challenges of community revitalization and sustainability on the Tibetan plateau. Participants will work on developing a shared understanding and engage directly with these challenges to strengthen communities on the Tibetan plateau. These efforts will enable us to create a portal for developing new partnerships and synergies in our community to address these issues. The core ideal of the trip will be to promote the welfare of the public good by moving beyond the boundaries of separated communities through collective action to influence others while cultivating shared understandings, cultural awareness, using critical and integrative thinking. I want to address the immediate need within the community for long-term, sustainable solution to the challenge by working with the locals and fostering their agency. The service trip will be directly publicized to the students in the East Asian, Environmental Science, and Sustainable Development departments, and will also be added as blurbs in a few mailing lists. Team members will first fill out an application and go through an interview in which Professor Barnett and the trip leaders will do the selection process. Participants will be assessed on their commitment to service, sustainable development, environmental/social justice, and East Asia; also on how they will incorporate the experience they will gain from the trip to their academic pursuits. Every participants will be mandated to commit to every meeting, which will prepare the participants to develop cultural competency and understand the local issue. This entry was posted in Uncategorized on November 18, 2011 by sth2114. In Angola there is a façade that times have changed. After twenty-seven years of civil war, Angola appears as a place that is finally at peace. In comparison to other African nations, Angola has been considered to be exemplary. The International Monetary Fund projects a twenty-four percent economic growth in the country this year — one of the fastest rates in the world. Angola is second largest oil exporter in Africa. Oil accounts for more than half of the country’s gross domestic product (GDP), eighty percent of the government’s revenues and ninety percent of export earnings. As reported by the New York Times, the government is taking in twice as much money as it did three years ago. Despite Angola immense growth in the past couple of years, it still has one of the highest rates of poverty in the world. In a December poll by a pro-democracy group and the United States Agency for International Development, six in ten Angolans said their economic situation was no better now than five years ago. 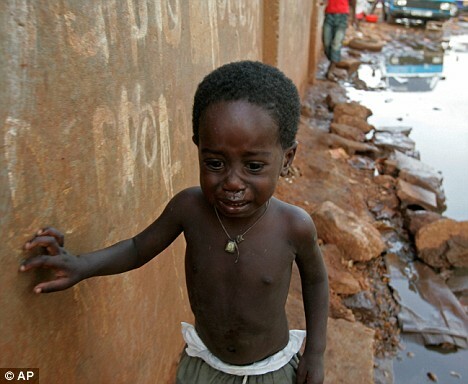 Currently, seventy percent of Angolans live in poverty; eighty percent have no access to basic medical care. The average life expectancy is only forty years, and three in ten children will die before reaching their fifth birthday. In 2002 about US $210 million was spent on emergency aid to Angola. Where is the oil money going? The staggering rates of poverty can be correlated the ongoing corruption in of the Angolan government. On February 5, 2010, Angola adopted a new constitution. In a April of that same year, a law was passed to curb Angola’s endemic corruption; this is part of President Jose Eduardo dos Santos new “zero-tolerance” anti-corruption discourse. The government has made claims that it has implemented steps to build the country’s infrastructure. According to Aguinaldo Jaime, the nation’s deputy prime minister, Angola has invested between $8 billion and $9 billion in loans from China since 2004, exchanging guarantees of oil supply for reconstruction work. The lack of progress with regards to these development projects proves otherwise. The government seems to be more interested in filling it’s own pockets with billions of dollars of oil revenue that has illegally bypassed the central bank and disappeared without explanation. Although the Angolian government has improved the publication of oil revenue figures, according to a Human Rights Watch Report, human indicators in Angola remain abysmal and do not commensurate with the rapid growth of Angola’s national wealth. This brings to light the fact that there has been no agency for Angola’s corruption. China, the nation’s largest investors, trading partner, and consumer of Angola’s oil, has completely disregarded Angolan corruption, of which they are aware. The China Investment Fund, a prominent private Chinese company has extensive ties to Sonangol, the Angolan national oil company, where corruption is most prominent. As China continues to buy oil, the rich in Angola continues to get richer , while the poor continues to suffer. This entry was posted in Uncategorized on November 18, 2011 by Lydia Schulman. Seahorse on Coral Reef. Photo Courtesy of WildSingapore/Flickr. Seahorses that live on coral reefs are used in traditional Chinese medicines. Unfortunately, these creatures are endagered due to over-exploitation. for cures for disease. Reefs have already been the source of a number of medical breakthroughs, and scientists hypothesize that there are more medical treasures to be found on coral reefs if we continute to explore all of the life that lives on them. Like other biologically diverse and productive ecosystems (for example rainforests) coral reefs have been the source of many medical discoveries. Both modern scientists and ancient cultures have tapped into the potential of coral reefs to provide cures to some of the medical problems that ail humankind. If we let coral reefs die out, we will lose with them, all of the biodiversity found on them, and in turn, all of the organisms that have the potential to provide cures to medical problems. Bruckner writes that this is becaue “marine organisms have greater phylogenetic diversity, including several phyla and thousands of species found nowhere else. Coral reefs are home to sessile plants and fungi similar to those found on land, but coral reefs also contain a diverse assemblage of invertebrates such as corals, tunicates, molluscs, bryozoans, sponges, and echinoderms that are absent from terrestrial ecosystems.” The the sheer diversity in reef environments contributes to their potential as a source for cures to disease. Further, as Bruckner notes, animals on reefs “spend most of their time firmly attached to the reef and cannot escape environmental perturbations, predators, or other stressors. Many engage in a form of chemical warfare, using bioactive compounds to deter predation, fight disease, and prevent overgrowth by fouling and competing organisms. In some animals, toxins are also used to catch their prey.” Often times these natural defense can be channeled into medicines, and can potentially “yield life-saving medicines or other important industrial and agricultural products” for human use. Coral Reef. Photo Courtesy of USFWS Pacific/Flickr. Bruckner also points out that the eastern cultures have looked to reefs for cures for disease since the 14th century. Specifically, in places such as China, people used, and continue to use, reef-dwelling seahorses as medication for respiratory problmes, skin ailments, etc. In the modern era, one of the most significant medical breakthroughs to come from coral reefs lead to the development of a drug called AZT. AZT is a drug used to slow the progression of the HIV virus into AIDS. According Bruckner, AZT was developed from extracts from a certain species of sponge that lives on coral reefs in the Carribbean. He also states that another drug, an anti-cancer medicine called Ara-C, was developed from extracts from reef sponges. The potential for the development of drugs from coral reefs does not stop here. The video below describes some of the links between coral reefs and anticancer medicines. The use of extracts, compounds, and animals taken from coral reefs for medical purposes poses an interesting question: Is the potential for medical discoveries in coral reefs a strong enough force to influence policy and practice to preserve them? From the video above, it seems like it should be, but often times, people are unaware that so many medical advances come from the natural world. The use of coral reefs as a source of medical compounds also runs the risk of over-explotation of coral reefs. Thus the question becomes: How do we study, explore, and extract materials needed from reefs to better human kind, without destroying or over-exploiting the coral reefs?